Aromatherapy Essential Oils Guide-Ylang-Ylang.Uses, benefits,history and facts. An introduction to Ylang-Ylang Essential Oil, its history, some ancient and traditional uses around the world are revealed ! 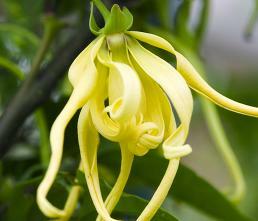 The benefits and uses for Ylang-Ylang Essential Oil as used by Aromatherapists. Descriptions of the plant, its family and source. Principal constituents and method of extraction. How to use Ylang-Ylang Essential oil with Olive oil for Hair - a deep conditioning treatment for all hair types. 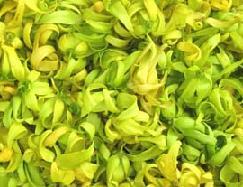 Ylang-Ylang Essential Oil is particularly good for thinning hair and hair loss. More great ways to use Ylang-Ylang Essential Oil together with Olive oil for a fantastic Olive Oil Hair Treatment - The ultimate, natural hair repair, using essential oils, suitable for all hair types. Go to Chamomile,Ylang-ylang and Patchouli Soap - A soap with the scents of paradise ! Go to Bergamot and Ylang-ylang Soap - a calming, soothing soap, great for de-stressing after a busy day ! Homemade bath salts are quick and easy to make, gorgeous to give and it is simply divine to slip into a bath with gorgeous essential oils and salts that will detoxify and ease those aching muscles. Mineral salts have been used in baths since Ancient times to rid the body of toxins and to relax and revive.....Epsom salts have been used widely to reduce inflammation and swelling and to soften the skin. Ylang-Ylang, sandalwood and patchouli bath salts recipe - warming, sensual and exotic. Natural Soap Recipes for Cleaning your Home made with Ylang-Ylang Essential Oil. Both of these Homemade Laundry Soap Recipes use Ylang-Ylang Essential Oil. Aromatherapy Essential oils guide - Soy candle recipes with Ylang-Ylang Essential Oil. 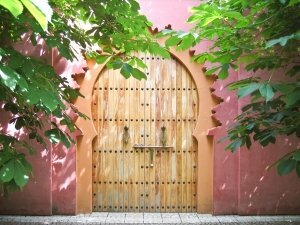 Return to Anayennisi Aromatics home page from Aromatherapy Essential Oils Guide - Ylang-Ylang Essential Oil. 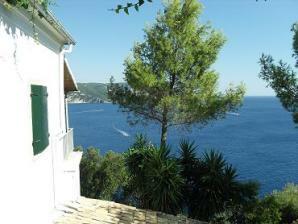 I promise to use it only to send you Anayennisi Aromatics News.